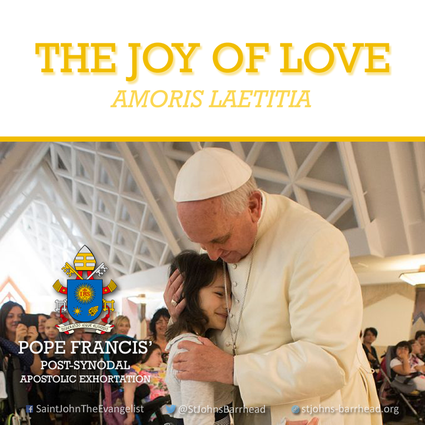 The Joy of Love (Amoris Laetitia) is the result of Pope Francis' prayerful reflection on the outcomes of two synods of bishops held in Rome: an Extraordinary Synod in 2014, and an Ordinary Synod in 2015, both on the topic of marriage and the family. The exhortation shares with the Church the Holy Father's teaching and encouragement on pastoral ministry to families, and what marriages and families are called to at this point in time. ​Amoris Laetitia covers a wide range of topics related to marriage and family life, with a particular emphasis on the family's vocation and mission of love. It speaks about the family's strengths and gifts, and also the contemporary challenges faced by families throughout the world. The exhortation encourages married couples, families, and pastoral ministers to accompany and care for families and others in need of the Lord's mercy and healing. It includes an extended reflection on love and what it means in the day-to-day reality of marriage and family life. This document is for all who care about the future of the family. It is addressed to Bishops, priests, deacons, consecrated persons, Christian married couples and all the lay faithful. In particular, married couples can be reminded of their call and mission through this exhortation, and families can find it an ongoing source of inspiration. Click the icon below to download the document to your device.